You can create playoff brackets using either the PRO or Tournament Scheduler. If you are currently using LITE, click the green PRO Features button on the Schedule Maker page, and then Upgrade Now to add Playoffs to your existing schedule. For TOURNAMENTS – make sure to set up your playoffs before you generate the schedule (in tournaments all games are created and allocated in one go). For LEAGUES – you can wait until the end of your regular season to set up playoffs (they are generated separately). For most standard brackets, you will only need to put the number of teams and click Save Bracket. For more on the different bracket settings, see Playoff Modes. 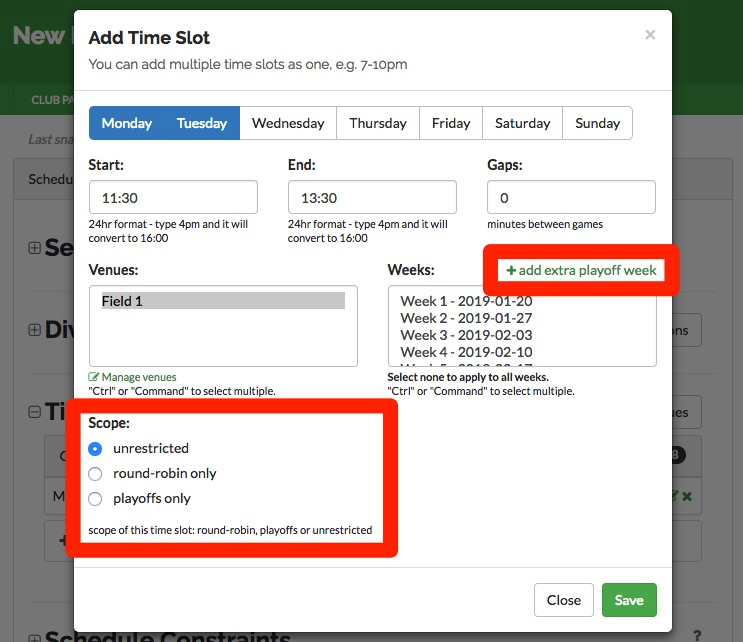 For leagues, you'll want to make sure you have the right time slots set up for your playoffs. Go to the Time Slots section and edit an existing or add a new time slot. Once you've added at least one bracket, you'll see a link above the Weeks field on the time slot form to add extra playoff week. This adds a week to your season to hold your playoffs. You can add more than one. These new weeks will also apply to any existing time slots that apply to all weeks (i.e. that don't have a subset of weeks selected). You can also specify if a particular time slot should be used only for playoffs or both playoffs and round-robin (unrestricted) or just round-robin games. This is useful if your playoffs start in your final week of the regular season or, in tournaments, if your playoffs should be constrained to a certain day or time frame. Note: for tournaments, you will not see that button. Instead, you need to define your brackets before you generate any games. If you've already generated a schedule, click erase games and regenerate the whole schedule in order to generate the playoff schedule. See this article for how to update your brackets with teams from standings after your group/pool stage.